We Christians, that comprise the Body of Christ are commanded to strive to maintain the unity in the Spirit in the bond of peace. Because we are one body, one Spirit and we are called to one hope of our calling. We have one Lord, one faith and one baptism, and one God and Father of all, Who is above all, through all in all of us. 20 Neither pray I for these alone, but for them also which shall believe on Me through their word; 21 That they all may be one; as Thou, Father, art in Me, and I in Thee, that they also may be one in Us: that the world may believe that Thou hast sent Me. 22 And the glory which Thou gavest Me I have given them; that they may be one, even as We are one: 23 I in them, and Thou in Me, that they may be made perfect in one; and that the world may know that Thou hast sent Me, and hast loved them, as Thou hast loved Me. The answer to our Lord Jesus Christ’s prayer is on its way. We do not see this unity in the Spirit at this time, but wait on the Lord, have faith and patience, and He will bring it to pass. The true unity of the Spirit is to preserve the authenticity of Jesus Christ, and to accept no other counterfeit. We must know the Lord in Spirit and in Truth so that we will not be deceived by all of the false Christ’s, false doctrines, and false ministers that will be rampant in the coming end times. The lies of Satan are on every side telling us that there are many ways to God, and Satan is sending out many very alluring false Christ’s who come as angels of light. Many today are being totally deceived by these deceivers. That is why; it is very crucial that we understand that our God “will” build His church in the coming times, and it will be the glorious last day church which will be the Bride of Christ that our Lord will come back to receive unto Himself. Hallelujah! The enemy of our souls is trying 24/7 to block this awesome work of God. However, God’s church will be a reality, and it will have the unity of the Spirit in the bond of peace and it will have His love one for another. We, Christian should make ourselves ready to be worthy of participating in this beautiful church and family of God. are to pray and seek the Lord, each and every day as to what we are to do, and we are to learn how to be “led by The Holy Spirit” because this will be a crucial necessity in the Lord’s true Church. No human being will be leading the people of the real church that will be built by Jesus Christ as the Head. The Holy Spirit will lead these people, because they have learned to be led by The Holy Spirit in their daily lives. The church system that is being thrust forward in many churches today will become a total travesty to those who know their God. The church will become a safe haven, refuge, worship/Bible study center and House of Prayer. 19 “Behold, I give you the authority to trample on serpents and scorpions, and over all the power of the enemy, and nothing shall by any means hurt you. 20 And the God of peace will crush Satan under your feet shortly. The grace of our Lord Jesus Christ be with you. Amen. 18 Then Jesus came and spoke to them, saying, “All authority has been given to Me in heaven and on earth. 1. God has legitimately purchased all authority in heaven and on earth through His death on the cross. 2. We, His people have been given His authority to do His will and His work. 3. The enemy has illegitimately and illegally taken authority over the territory that belongs to our God, our Lord Jesus Christ, and His beloved saints. 4. Our participation in the will and work of Jesus Christ is to take back the territory that Satan has confiscated by default. 5. This must be accomplished through the good fight of faith in the unity of the Spirit and in the bond of peace. We need to pray according to the Word of God. We must know the Word of God, and we must fight the good battle of faith in bringing the Word of God into reality and to bring the Kingdom of God upon this earth. We pray in the unity of Your Spirit that You will expose “all” of the evil deeds of darkness in our area, our country, and the world. We pray that You will destroy “all” of the works of Satan, his weapons and his hiding places in our area, our country and all over the world. We pray that Your Spirit will raise up a mighty standard against the enemy and his powers, principalities, strongmen, strongholds and wickedness in high places. May all of these evil spirits be confounded, and put to flight, and may all the schemes of Satan be pushed back to Eden. We pray for the peace of Jerusalem, and the salvation of all those in darkness. We pray that they will have the light of heaven come upon their minds so that they will call out in the Name of Jesus Christ. Please raise up your men and women of God to take back Your territory from those who have stolen it illegally. We pray for the church that the gates of hell will not prevail upon it. Thank You Father God, Lord Jesus, and please pour out Your Holy Spirit upon all people to draw them to Yourself. May Jesus Christ’s Name be lifted up so that He will draw all men, women and children to Himself. We pray and ask all of these things in the almighty power of the Name of Jesus Christ and all for His glory, amen, amen and amen. Margaret (Peggy) Kannaday has been the Managing Editor of “Church Growth International” since 1991. C.G.I. 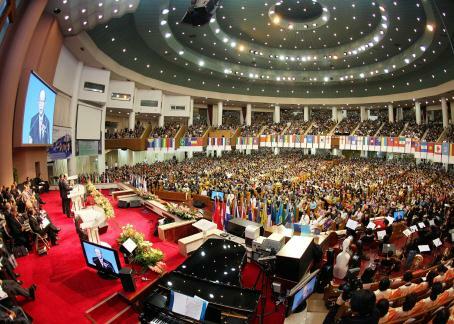 is the English outreach of The Yoido Full Gospel Church which is headquartered in Seoul, Korea.under the Sr. Pastor Emeritus Yongi Cho and Sr. Pastor Younghoon Lee.